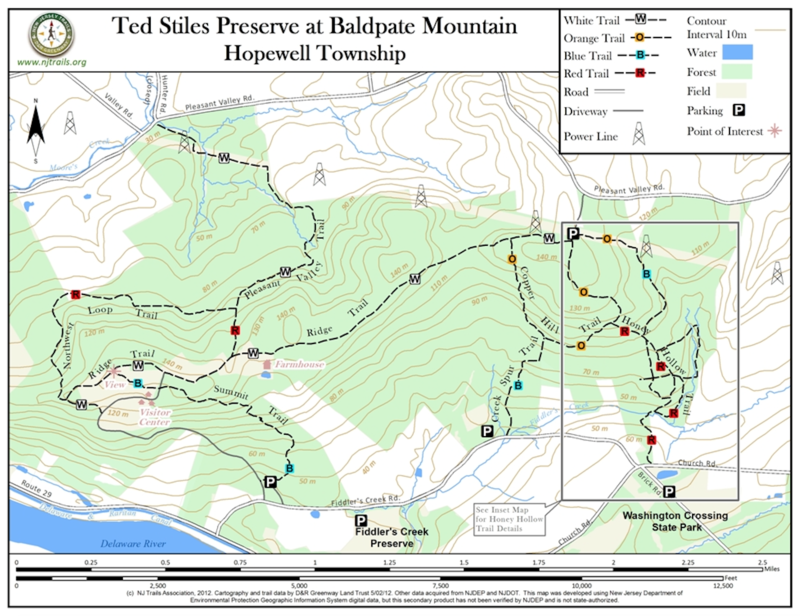 The land that makes up the Ted Stiles Preserve at Baldpate Mountain has gone by many names, from a 1900’s farming community called Honey Hollow to a family property owned by a prominent Trenton family, to a potential quarrying location turned potential luxury housing development turned actual nature preserve. Echoes of the area’s past can be found along the many hiking trails here, which guide you past the ruins of old farming buildings, spring houses, and the repurposed Strawberry Hill Mansion. Reach the clearing by the mansion and you can picnic while enjoying the view of the Delaware River and the City of Trenton. Although plans to convert this area to a quarry never came to fruition, there is an active mining operation nearby. This results in a hilarious overabundance of DANGER: BLASTING signs along some of the preserve’s western trails. The Strawberry Hill Mansion features a garden of native plants, new stone patio with expansive views, and toilets. Score! The switchback trail here has been voted “Most Aerobic Walk” in the county, climbing 425 feet in around 6/10 of a mile. It’ll make you work for it. There’s also an open trail under a series of power lines. Stretching for miles, the powerline trail is a great place to spot birds, from goldfinches to turkey vultures. Thistle along the powerline trail. I think this was a springhouse. Now, it is emo. Spider going for dramatic effect. Probably just needs an oil change. Ruins of an old farmhouse. Signs, signs, literally everywhere along this trail. Ruins of the old farming community.